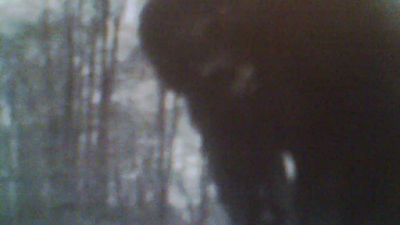 Sometimes, I randomly scan the internet for reports/videos of our hairy friend, Bigfoot. Well, during my recent snooping around I ran across a video that on the surface appeared pretty interesting. The video comes from Russia and appears to have been uploaded several months ago. In a nutshell, this guy starts filming what appears to be a bigfoot. He attempts to follow it and captures it a few more times on video. 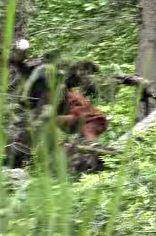 The above pictures is a still frame from the video as the figure passes between two trees. The video is in Russian, so I don't know what he is saying. Before I get into more about the video, it would probably be good if the readers watched it. I want to see if you come to the same conclusions as me. 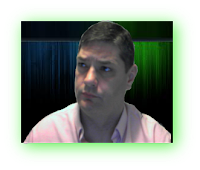 Now if you are skeptical of this video, I think you are on the right track. It seems the good 'ol USA is not the only place that has bigfoot hoaxers and jokers. Russia is probably in second place for fake bigfoot videos, right behind the USA. There are some things I would like to point out, if you would just humor me a couple minutes. One thing you should notice is that the person filming does not do a very good job appearing excited or shocked at filming/seeing a bigfoot. But the dead give away is at the very first of the video. The figure is crouched next to that root ball or tree and you can see the folds and wrinkles in the suit. 'Ol wrinklefoot strikes again! Now in defense to the poster of this video, I'm not sure what he is saying, seeing how I do not speak Russian, he may be making it clear the video is for fun and entertainment. I hope no one takes this video serious and thinks it is of an actual bigfoot, but knowing the bigfoot world, I'd say there is a pretty good chance of it. One thing I fine interesting is that Russia has people faking videos, much like we have here in the USA. We know here in America, people fake videos for various reason. Sometimes it is for money and fame, other times it is just to poke fun at the idea of Bigfoot and then I think some of it is just to muddy the waters about the existence of bigfoot. I guess the lesson here is that most people in the world are much the same, regardless of what language they speak. Sometimes it is just better to laugh than cry.